St.Austell. The centre of the china-clay industry, and on Carclaze Downs to the north of the town there are what appear to be white mountains- mounds of sand left behind from the china-clay washings. Interesting buildings are to be found in the town such as the Market house dating from1791, and the Holy Trinity Church. 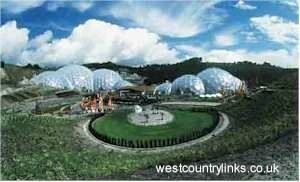 The Eden Project A millennium project based in Cornwall, England. Two giant conservatories are being constructed to nurture plants from the steamy rainforests and from the warm temperate regions of the world. Sea Fishing from the Pier, shore and rocks at Falmouth; also off-shore fishing. Shark fishing can be arranged with local fishermen. 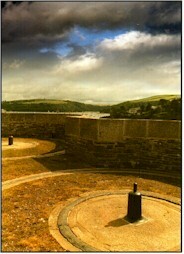 Falmouth is the main centre with a regatta in August. Boats may be hired at Falmouth.